Recommended to: Readers who enjoy gorgeous writing and seriously wonderful characters! On Internment, the floating island in the clouds where 16-year-old Morgan Stockhour lives, getting too close to the edge can lead to madness. Even though Morgan's older brother, Lex, was a Jumper, Morgan vows never to end up like him. She tries her best not to mind that her life is orderly and boring, and if she ever wonders about the ground, and why it is forbidden, she takes solace in best friend Pen and her betrothed, Basil. Beautiful. Just beautiful! If I overuse any adjective in this review, I can guarantee you it will be "beautiful". Though you can trust me when I say that it's totally warranted. I loved this book. The kind of love that makes you swoon over and over the further on you read. Okay, okay. I'll stop gushing so blatantly. I really think you need to read this one though. I really do. Morgan Stockhour is growing up on a floating island in the clouds. Intrigued? I was. I adored was the idea of the unknown world below. Imagine floating above the clouds. Unable to leave the small world you've come to know. I fell in love with the image that floated into my head while reading. Morgan's curiosity felt on point with what I'd feel. She wasn't unhappy in her life. Not entirely. Simply filled with wonder at what could be just beyond the barrier. Add in a King who isn't exactly benevolent and a violent murder, and you have a gorgeous mystery that is just waiting to unfold. 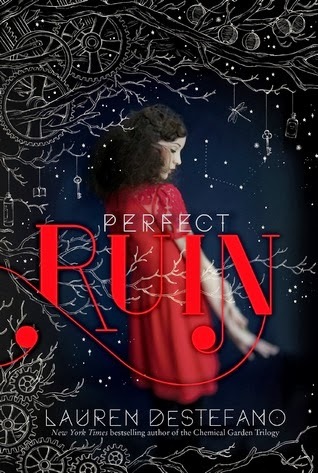 I read Perfect Ruin cover to cover in a few days. I was lost in the beauty of Internment, and the grittiness that was lurking just beneath the surface. It's been a while since a book has so wholly immersed me that I didn't want to set it down. There was something about Morgan's innocence, about the way her eyes were slowly opened to the truth, that wouldn't let me go. I know I'm being vague, but trust me when I say that it's necessary. I don't want to spoil a single minute of this for you. Suffice it to say that Lauren DeStefano has built a world that is well worth your time. Oh, and the ending! Cliffhanger doesn't even begin to describe it, so don't say I didn't warn you. However, if you love Perfect Ruin as much as I do, you'll be chomping at the bit for more. Perfectly paced, hauntingly written, and utterly perfect. Thank you Lauren DeStefano for giving me a new place to visit in my head. This book is beautiful, and I am so ready for more. Fiction Bundle: Book Bundles With a Purpose!